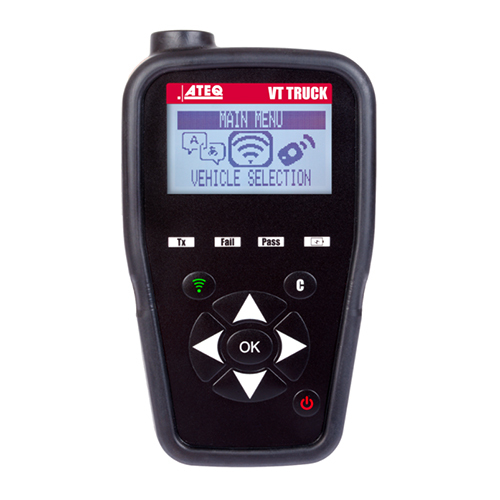 ATEQ VT TRUCK tool is ideal for European transport fleets, truck dealerships and multi-brand service workshops. Today, the road transport industry is facing three major challenges: cost efficiency, safety, and environmental concerns. TPMS systems address simultaneously all of the challenges by monitoring tyre health in real-time. According to an independent study, about one quarter of all truck tyres are underinflated, running at least 10% below the recommended pressure, causing breakdowns, increased tread wear and fuel costs. By checking the truck tyre pressure regularly – for example every time the vehicle enters the company warehouse – companies and fleet managers can dramatically improve tyre life and the overall truck security. ATEQ VT TRUCK easily checks tyre pressure and sensor batteries to prevent under-inflation and reduce vehicle down-time due to tire blowouts (breakdowns). The tool is compatible with most European truck and bus TPMS sensors and benefits from a constantly growing vehicle coverage, thanks to frequent database updates.